You love running, but your feet are really feeling the aches and pains. You aren’t sure how much longer you’ll be able to hold out at this rate. Before you consider hanging up your running shoes for good, take a closer look at your shoes. They might be the culprit. You might just need the best cushioned running shoes you can find. Do I Need Cushioned Running Shoes? Not every runner will need cushioned shoes. We’re all built differently, and our shoes should be too. Some runners tend to do better with minimalist running shoes that offer very little cushioning. But using those shoes might land other runners in their doctor’s office with a host of running injuries. The key is finding a type of shoe that works best for you. If it feels good on your foot, you’ll have fewer injuries. If stiff, hyper-supportive shoes hurt after a minute of walking in them, imagine how you’ll feel running a half marathon in them. Running in a pair of shoes that causes pain is crazy because there are so many options out there. It can be confusing to cut through all the marketing and hype to find the best pair of running shoes for your feet. So how can you tell if cushioned shoes are for you without buying a wide selection of shoes and giving them a test run? First of all, you can look at your gait. Cushioning shoes are best for people who have a neutral running gait. They also work well for people who roll their feet outward slightly when they run. You can figure out your gait in three different ways. You can visit a high-end running store that will have high-tech gear and trained salespeople that will figure out your gait for you. If you prefer to order your shoes online, there’s an easy way to tell if cushioned shoes are right for you. Look at an old pair of running shoes, preferably ones that are really well worn. Do they look like they have an even amount of wear on both the inside of the foot area and the outside of the foot? If so, you likely have a neutral stride. Finally, you can give yourself the Wet Feet Test. Grab a bowl of water and head to the nearest driveway or sidewalk. Take off your shoes and socks, submerge your feet in the bowl and take a few steps on the concrete. You’ll be able to see your wet footsteps on the pavement. If you see the impression of your entire foot, you’re an overpronator. If you see a slight chunk of the inside of your foot missing from the wet footprint, you’re a neutral pronator. If you see almost the whole midsection of your foot missing from the footprint, you are an under pronator. These days, runners come in all different shapes and sizes. That’s great news because it means more people than ever before are reaping the health benefits and the joy of running. But those different body types often require different shoes. A petite runner who struggles to keep weight on may be fine without extra cushioning in their shoes. A heavier runner, though, may need that extra cushioning to help ward off problems or just to even make their feet feel better. While all heavier runners won’t need extra cushioning, if you’re having heel problems or your feet just feel worse than you think they should after a run, you should consider trying out cushioned shoes to see if it helps with the problem. If you’ve suffered the pain of plantar fasciitis, you’re willing to try anything to get rid of it. Plantar fasciitis gives many runners almost crippling heel pain when they get out of bed in the morning or after any period of inactivity. It’s painful and it can seriously affect your training schedule since one way to treat plantar fasciitis is to take a break from running or at least reduce the miles you log every week. But there’s another way you can put the brakes on plantar fasciitis, and it may not require any time off at all. By wearing cushioned running shoes, you can reduce the pain and risk of plantar fasciitis. That extra cushioning can especially help if you’re an overweight runner because having excess weight is one of the risk factors of plantar fasciitis. But it’s not only overweight runners who are at risk of developing it. Plantar fasciitis also often affects high-volume runners. This is because they are logging so many miles of a repetitive motion, it puts stress on soft tissue. Even in this case, cushioned shoes help because it takes some of the force of the striking motion off of your heel when you run. Anything that helps absorb some of that blow will be beneficial to you. Hoka One One Clifton 3 running shoes have a reputation for providing superior cushioning. They’ve saved many runners who have dealt with plantar fasciitis. They are best for road running or using at the track. If you wear these during trail running, they won’t hold up as well. If you haven’t worn Hokas before, you’ll notice they are built kind of like the foot of a rocking chair, with a curve throughout the bottom of the shoe. Tremendous cushioning feel -- it really feels like you’re running on clouds when you wear these. This neutral shoe has been made with a wider forefront. Your foot won’t feel as squished while you’re running as it may have with the Clifton 2, which didn’t have as roomy of a forefront. 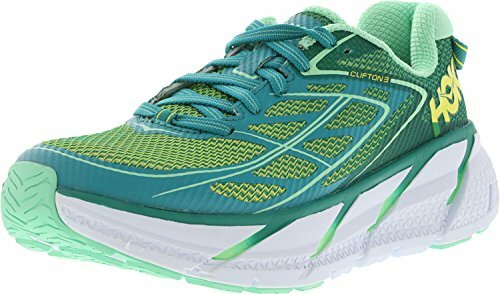 The Clifton 3 is lightweight and uses mesh that will let your foot breathe as you run. They come in several different color patterns. These shoes are well-made and will last. These aren’t the most attractive running shoes you’ll ever own. Even with the wider front, this shoe is too narrow for some runners. If you have a narrow or normal foot size, you should be fine. This road-running shoe has enough cushioning that you’ll be able to continue your run while focusing more on your breathing than on foot pain. This shoe has mesh on the top part of your foot area, so you’ll get stretch when you step. The mesh also offers great breathability that will help keep your foot cooler, even when you’re running in hotter weather. It has a removable foam insole in case you need to take them out to make room for doctor-recommended orthotic inserts. 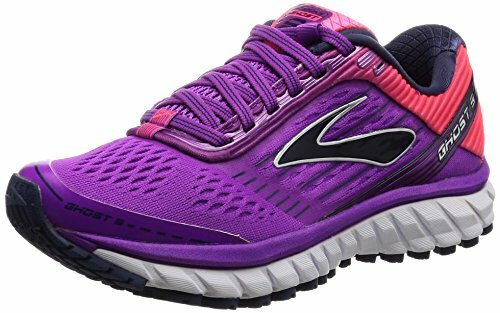 This neutral shoe feels extremely light on your foot, which is great for runners who hate to be burdened by heavy-feeling shoes. It has Biomogo DNA midsole cushioning that helps soften the blow with every step you take. It also has Omega Flex grooves which give the shoe great flexibility for runners who don’t do well with rigid shoes. The grip on these shoes is impressive. The shoes start to wear quicker than many other running shoes do, which is disappointing considering how expensive they are. These shoes seem to run small on their sizes -- you may need to order a bigger size than usual. The Gel-Nimbus 17 is great for people with neutral strides and under pronators, and they offer all the cushioning you should need. These shoes will keep your feet nice and dry, even on long runs. They have great breathability because of the upper mesh. The padded collar on this shoe will stop blisters from forming. The reflective logo is a nice touch. The cushioning on these shoes is fantastic -- they have a FluidRide midsole and a rearfoot and forefoot gel-cushioning system. The gel cushioning helps cut down on the shock of impact. The shoes will fit well, but they’ll also stretch to give you great flexibility. Because these shoes are so lightweight, you won’t feel like your feet are dragging like they might with heavier shoes. Lighter-feeling shoes can improve your pace and keep you running longer. These shoes are roomy in width, so unless you normally need narrow or wide shoes, you’ll be happy with the fit. While the width is fine on these shoes, the sizing seems a bit off -- you’ll want to order a smidge larger than normal. The seam on the tongue of the shoe can be a little irritating, so you’ll want to make sure you have a quality pair of running socks on your feet. 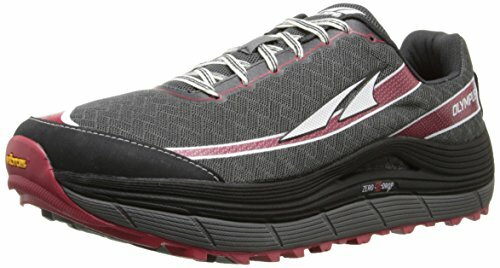 If you plan to hit the trails this year, you’ll need a shoe like the Altra Olympus 2 that can stand up to the terrain. One close-up look at this shoe will show you how much cushioning it has. From the padded collar to the cushioning on the insole, there’s not an area of your foot that will need more cushioning. If you’re tired of scrunching up your toes in narrow toe boxes, you’ll love how much room these wide toe boxes have. These shoes have great grip. 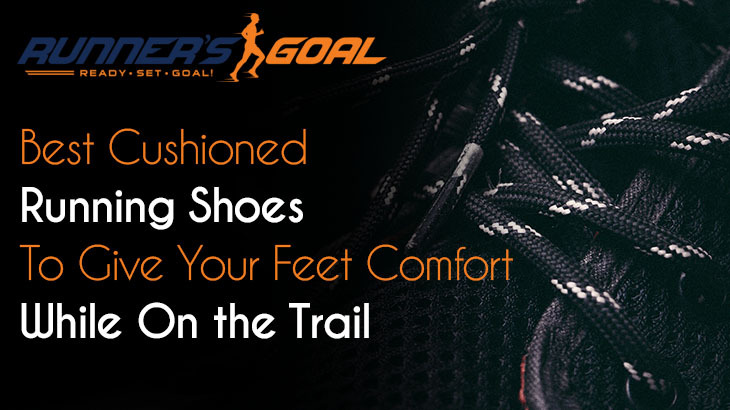 The outsole of these shoes will grip the ground even while you’re running uphill or downhill. The bottom of the shoe won’t trap dirt, which makes them great for running trails. It’s lighter than the previous style of this shoe, so you’ll feel quicker on your feet. If you don’t like the rocking-type of sole that Hokas have, you’ll like this shoe. Despite its heavy padding, it doesn’t have that much of a curve. It’s a zero drop shoe. You’ll get decent breathability with these shoes because of the upper mesh. There have been problems with some runners having the toe box blown out of these shoes. The sizing isn’t true -- you’ll need to order bigger shoes with this brand and style. As with the Hokas, these running shoes won’t win you any fashion awards. This is a nice-looking shoe and one that will feel great on your feet. 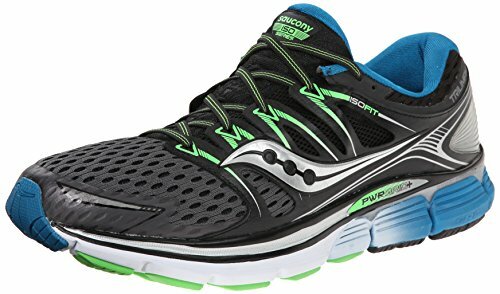 If you’re looking for comfort, but also worry about flashing your style, you may want to check out Saucony Triumph ISO. This shoe has a floating support cage, which means that it will accommodate your foot shape and movement. It has a proprietary foam midsole, which claims it has 20 percent more cushioning than a normal midsole would. It’s a lightweight shoe. The men’s version weighs 10.3 ounces and the women’s version weighs only 9 ounces. There’s decent breathability with this shoe, thanks to the upper mesh. The traction outsole gives you a good grip whether you’re going uphill or downhill, or doing speed work. It has a moisture collar which will keep your feet dry. There’s a little reflective material on this shoe. While you rely on your outfit more than your shoes for reflectivity, any little bit helps. The cushion is a little lighter in the heels than the rest of the shoe which might be a problem for runners who have a hard heel strike. The mesh shows signs of wear and tear fairly quickly for a high-end running shoe. Hoka One One Clifton 3 is tops when it comes to the search for the best cushioned running shoes. If you don’t mind that rocking chair sensation, these shoes should spare your feet from their usual aches and pains. These shoes aren’t attractive, but most of us aren’t running with fashion in mind. We’re after protecting our legs and feet so we can run for as many years as possible. 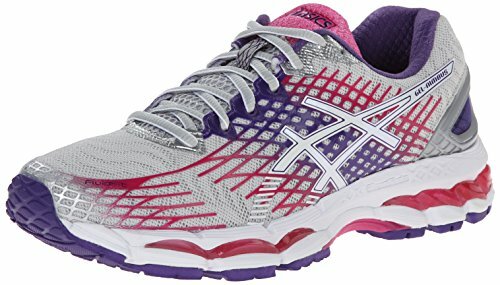 The cushioning is fantastic in these shoes and the wider forefront is appreciated by many runners. Despite having so much cushioning, these shoes are lightweight so your legs won’t feel burdened by your workout.